Zylam® Liquid Systemic Insecticide from PBI-Gordon is formulated to deliver fast and effective insect control. It provides exceptional control of more than 100 listed insects, including aphids, bagworms, Japanese beetles, and scale, plus season-long control of Emerald Ash Borers. 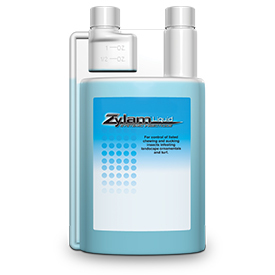 Labeled for use on residential and commercial sites, golf courses, athletic fields, and school grounds, Zylam Liquid quickly translocates through the tree for fast control. And Zylam Liquid applied through bark banding or soil drench can save labor and equipment costs while protecting the tree from insects and drill damage. PBI-Gordon Corporation issued Section 2(ee) recommendations for use of Zylam® Liquid in 2019 for the control of Spotted Lanternfly. This additional use recommendation is permitted under Section 2(ee) of the Federal Insecticide, Fungicide and Rodenticide Act (FIFRA) in the following states but has not been submitted or approved by the EPA: Connecticut, Delaware, Maryland, New Jersey, Pennsylvania, and Virginia. A 24(c) Special Local Need Labeling has been issued for distribution and use only within the State of New York for control of Spotted Lanternfly on Tree of Heaven.